On Monday, I took a shot at “experts” and challenged us all to remember to have some FUN even though “fun” often makes us feel like slackers. Yet, let’s be clear. There is mistakenly “feeling” like a slacker and actually being one (FYI: I have gold medals in both). Thus, today one might be tempted to think I am contradicting what we talked about last time. Wait, we actually DO need experts AND now she’s gonna start championing PAIN? Yeah well, I’m a puzzle wrapped in an enigma. Whatever. Roll with it. The thing is, whether we are a hobbyist (which is COMPLETELY wonderful and rock on!) or we want to GO PRO, it really doesn’t matter. Lamb’s Rule of Writing #1: Not sucking way more fun than totally sucking. Yes writing is and should be FUN (but it will also have pain, doubt and ups and downs much like that “Fun Run” we did to raise money for cancer research). Yet, we are talking about writing today, thus I feel it’s safe to say high school and college gave us zero training on how to write commercially successful novels. If we want to make money selling books? Writing is a craft and a business involving producing a product for sale to consumers (code for “readers”), so experts a HUGE help. All I am going to say about that (for now). Cool thing about any level of writing is we have freedom to choose our pain. I’m a huge fan of National Novel Writing Month (NaNoWriMo) namely because it is fabulous for all types of writers (those who want to have fun and those who seek to go pro), and we will discuss three BIG reasons why in a moment. Most people who follow this blog do, however, dream of one day going pro and a) NOT sucking and b) selling truckloads of books. Thing is, this transition does NOT happen overnight #AskMeHowIKnow. In fact, I strongly encourage authors of all levels to check out an older post for some good old-fashioned perspective: The Three “Acts” of a Writer’s Journey From Newbie to Master. It is OKAY to need help. A caveat…slackers (which we can ALL be) must be choosy about our team when going after any goal. If our goal is to climb Mt. Everest (and being a NYTBSA is essentially Everest & making good money full-time writing is K-2), who do you want by your side? This is the dude who’s summited Everest so many times even Instagram is rolling its eyes at him. Hard@$$ Hank knows his stuff. He maybe even lost a couple fingertips to frost bite, tells the story how he once contemplated eating his best friend to survive a sudden blizzard (then found spare protein bars and murder/cannibalism averted due to proper prep). The guy who insists you train hard for at least a year and who warns you over and over that if you $#@! up an inch…you will DIE (and he won’t hesitate to snack on you if you die from being stupid). Hard@$$ Hank who beats into you that it is a LONG freaking way to the top. Dangerous with pitfalls, and ice sheers and avalanches. That the summit is way farther than it looks and harder than you could ever imagine but worth every single second. Loving Lulu does love you and has been your greatest cheerleader since fourth grade. She meets you for a pumpkin spice latte and tells you–in her most informative voice–that most of those “mountain climbing expert people” sell tons of needless gear simply to make money. And in Nepal, since there are no Starbucks or other meaningful jobs, the locals make cash working as slurpees for uninformed mountain climbing tourists. Lulu is your BFF and TOTES knows you rock. She has done cross-fit with you. She proclaims if you can run that hundred flights on the StairMaster? Everest *flips hair* No problemo. And she looked it up on her iPhone. Everest? Not even that high. Only 29,029 feet which is less than 5.5 miles high. The Turkey Trot y’all did last year was ten miles, so what’s all the fuss with a mountain? Wear a coat! JEEZ! Hank makes us feel overwhelmed and a tad terrified #Hater. Lulu? She’s your real champion #BFFUnicorn. Thing is, both Hard@$$ Hank and Loving Lulu are highly valuable but for vastly different reasons. One is a mentor-ally, the other a friend-ally. Easy to mistake the two 😉 . Lulu’s “mountaineer training” leads to a cold and lonely death where our body is never recovered, unless one counts future archeologists. Why the hell did she pack so much lip gloss to climb a mountain? Did it have to do with her god? A sacrifice? Perhaps to ward off evil spirits? Hank as cheerleader leads to heavy drinking and needless therapy. But reverse the two? And POW! POWER TEAM! Trust me when I say I would’ve quit long ago if I’d only enlisted cheerleaders. The slacker in me loved that they loved me even though I never finished anything I started. They believed in my genius. To overcome my inner slacker, I HAD to get brave enough to make friends with mentors and teachers who terrified me, who pushed me to change in the ways that would matter most in the end. But I ALSO needed Lulu there to bring me wine and encourage me when Hank made me cry. Lamb’s Rule of Writing #2: We ALL start somewhere. NYTBS mega-authors are not hatched in a lab…yet. Amazon is working on it though. But since, Amazon is not yet able to grow genius authors in petri dishes we still have our shot. Yet, I am here to take your sparkly little dreams…and yell at them. As your self-appointed Hard@$$ Hannah, I want to give you three fantastic reasons to do NaNoWriMo, since it is AMAZING for training out the slacker in all of us. I remember years ago thinking, “Wow, if I could just write a thousand words a day, that would be AMAZING.” When I looked at professional authors, it was like watching an ultra-marathon runner—all the while knowing I couldn’t run a flight of stairs without requiring oxygen and possibly a defibrillator to restart my heart. I struggled to get words on a page, and Lord help me if I saw something shiny. Of course, after years of practiced discipline, I generally have a thousand words written by breakfast. When I fast-draft (which I do for all my books), my average is abnormally high. But that took YEARS to train to write that clean and that FAST. Being successful at writing is a lot about mastering our mind and focusing our will despite what is going on around us. NaNo (Hank) drives us into a zone we’d probably never step a toe into if left on our own. When part of Nano, we’re surrounded by a gazillion other writers all with the same goal. HELLOOO? Peer pressure? NaNo trains us to get in the zone no matter what. Too many noobs (me included) needed visits from the muse, perfect silence and the right pen just to get started. We allowed emotions and feelings to guide us and that’s why $#!& never GOT DONE. To finish a novel, even a crappy but finished one, our mind is the first thing we need to train. Writing is an extraordinarily intense activity, physically, mentally and emotionally. Sure, the professionals make it look easy and that’s why the world thinks we spend all day drinking wine and talking to butterflies. Hint: We don’t. Seriously it IS THE BEST job in the world. But no unicorn hug, ya dig? Lamb’s Rule of Writing #3: Life doesn’t stop because we decided to write a book. I’ve met NYTBSAs who were also working full-time jobs as lawyers, vets, doctors, business owners. Maybe, if they wrote full-time they were tasked with taking care of small children, seriously ill family members, elderly parents…all while meeting deadlines. Yes, even some “mega-authors” who we all assume have it made. They don’t. Being a best-selling author doesn’t give us immunity from LIFE. Pros just have learned through practice (and places like NaNo) that we do have the ability to press on in spite of circumstance (just have to train it). Because that is what PROS do. Yes, professional authors are human. We should take time to grieve, rest, have some fun, and chillax. Yet, we also appreciate life will dole out plenty of sucker punches. The difference is pros get back up and back to work and hobbyists use the sucker punch as a good reason to proclaim they actually preferred origami all along. NaNo isn’t about perfect, it is about finished. Writers who make a good living write at least a book a year and often more. Writers who spend all their time polishing their chapters are the ones who never finish, or they take five, seven or even ten years to finish a novel. Lamb’s Rule of Writing #4: The world doesn’t reward perfect, it rewards FINISHED. Also, “perfect novel” is a complete myth and chasing the PN has the same success rate as chasing Big Foot. Neither is ever likely to be found (or, if found, believed to be real). So there. You are free to go write finished but imperfect novels. We all struggle with slacking. It’s something we take on day by day, step by step and page by page and likely always will. What are your thoughts? Are you afraid of mentors who will push you? Maybe gotten a tad too comfy with cheerleaders? Maybe made friend-allies mentors and can’t figure out where you got lost? Hey, I’ve been guilty! Do you struggle with perfectionism? Can’t bring yourself to “write crap” so get stuck in edit mode for ten years? Have you overcome your perfectionism? Tell us HOW! I’m still working on that one, too. COOL WEEKLY DEAL!!! The “Write Stuff”–20 Pages for $40. A deep edit/analysis by MOI! I highly recommend you sign up for one of our upcoming classes listed below, especially to properly prep for Nano. Fail to plan, plan to fail 😉 . ****Note, those who subscribe by email, the visual gallery doesn’t show, so please click through and sign up! We look forward to seeing you and serving you in class! Helping you be the best you can so your work can stand apart 😀 . I think all your reasons are fabulous. I still won’t be joining NaNoWriMo. I have written three first draft novels this year. I MUST revise them. Finished a second draft revision on a book I completed last year at the end of August and got it back from my Alpha reader Monday. Promised to have those changes made and out to my Beta reader before the end of the month. Then, I am going to tackle the novel I finished in February. A peek at it warned it’s in rough shape. As for perfectionism, I tell myself I can do that later. Get words on the page. I think of it like throwing sand in a sandbox. Revision will turn it into a castle. But I can’t make the castle without sand. As always, you have found a way to inspire me. ?? Thank you. This post is exactly what I needed to hear. My first 4 novels were all written during NANO. I love that it pushes me to write, and I love having a network of other authors who are striving for the same goal. ? You rock, darlin! Thanks. Okay, okay, I’ll give NaNo a shot. I’ve been too much like the writer perfecting paragraphs all day, only to delete them the next. I’ve been stuck too long (naturally with excellent reasons) but am sick of it. Perfectionism isn’t getting me to the goal. I’ll try being messy for a while. Whatever it takes! Thanks Kristen. I need a Hardass Hank! You’ve come pretty close to convincing me to put my head in the wood chipper that is NaNo. Again. Oh you need to party with us over at WANATribe! We do it together every year and it’s loads of mischief and even some writing! Wow! I needed this today. I have been stuck in the editing rut, which then turned into the “life happens” rut, and even finding-15-minutes-to-write-seemed-difficult rut. I have been struggling with the feeling of being serious about writing, and trying to keep my family afloat. Did I mention that in September I was at a doctor’s office every week (sometimes twice?) for family members. Thank you for the reminder that even best-selling novelists still have to juggle all of life’s struggles. I’m feeling inspired after reading this, and I need to stop looking for the right routine and instead make the time everyday, versus hoping it will magically work out. I need the drill sergeant in my life. Writing a novel in November will be tough with some of my commitments, but maybe I shouldn’t wait to November. Maybe my month should start earlier so I get it done versus sitting around wishing I could. See you’ve already got me thinking! Thank you! I DO plan to participate in NaNo. I tried it out last year, my first time, but I was alone. And thus, not at all successful beyond a few days. I had neither a Hank nor a LuLu. But this year is different. I’ve fallen into a whole tribe of Hanks and LuLus, both of which fill different needs, as you said. And as a result, I am EXCITED about NaNo this year. I find that I’m better now at the work part. But the longer I work on a story (still too bashful to call it a book/novel), the more I doubt the quality of the tale. I insist myself to finish though. I wouldn’t be able to look in the mirror if I didn’t, regardless of my self-evaluation of the work. No NaNo for me this year, I’m afraid. I’m up to my neck in almost-finished and/or old but-salvageable-because-I-have-a-brilliant(? )-new-idea manuscripts jammed in the meatgrinder that is rewriting, editing, and production. While having three manuscripts to deal with is preferable to having none, it is, oddly enough, almost as overwhelming and enervating. Yeah, I know: never, ever satisfied. First, it’s hard for me to admit how close we are to November, Holidays, and the end of the year. Since you’ve invoked the NaNoWriMo, I have to ask, why November? Wouldn’t the dead of winter be best after the holidays? If I do a WriMo, it will have to be while I’m hibernating. I probably did something much worse, or at least my dear hubby thinks so. I just finished the 100 Day Book Challenge held on Becoming Writer, in the middle of summer. I gave up gorgeous days to meet deadlines. I’m still recovering from that. I just lost the twenty pounds I packed on keeping my nose stuck in the computer. I’ve ordered a standing desk. I like Nano and promote it for two big reasons. First, there is a LOT of support to see you through. Frankly, I have a joke with a colleague. When you go pro, EVERY month is NaNoWriMo. The word count of many a pro is easily twice that of the minimum to complete the 50K for NaNo because it is our job and we’ve had the training to do it and, I did mention it is our job 🙂 . But secondly, I had the same criticism. Why during the holidays? JEEZ! Talk about stress! Yet that is the point. There will never really be an ideal time and what better way to push ourselves to focus than during the most demanding time of the year? We might get up earlier and focus. We might decide on a word count that let’s us finish in 20 days so we have the rest of November to enjoy! 2500 words a day is actually quite doable if we 1) MAKE TIME and 2) JUST WRITE instead of editing the bejeezus out of our work. The POINT of Nano is to WRITE 50K words….not a Pulitzer in one month. THAT is the POINT! Too many writers will never be published because they are still retooling the first 50 pages. And in a year? They will have started something new or be rewriting the first 50 pages AGAIN. That’s part of why this post was long (other than brevity not my strong suit). There is NEVER an ideal time. Forgive me for this next part. I generally keep my drama under wraps since the world has it’s fair share, but it is a good example of how all this applies. In the past five years I have had fifteen deaths in the family. FIFTEEN. Granted I have an aging family but these were people who raised me, and more than a few who I was very close to. I lost the grandmother (who raised me) by inches to Alzheimer’s and watched her slowly leave and wither of four years. But I lost all but one grandparent, and aunts and uncles and on and on. We went from having to rent a public space to fit all of us for a get-together to a table at Denny’s being just fine. I have had Shingles, pneumonia (as a complication of Shingles), battled a three year trademark lawsuit that nearly bankrupted W.A.N.A., my husband going through TWO job losses, the family business being hit multiple times by thieves and even by a tornado….and that is JUST the TIP of the crap we have been through. All of this followed on the heels of my husband being ordered to deploy to fight in Afghanistan, and right after we received that deployment order? Spawn (age 2) had all his front teeth bashed into the maxilla if a freak accident and we had to have them surgically removed ($20K). And now me getting Shingles at 40 makes perfect sense, LOL. So many times I didn’t think I could make it another day. Yet, we get up, we (or some of us) pray, and we put one foot in front of the other and keep going because LIFE can be brutal. It is also very lovely but generally writing seems easier then. I think of the person I was before I became a writer (because being a writer has done a lot to make me face my poor character and has been the carrot God has used to help me change). SO many petty BS things used to derail me. I laid in bed, cried, slept, moaned, complained to any hostage…person who made the mistake of saying hello. And it was SILLY compared to what I’ve faced in the years as a writer. Yet I can say, the year I had the most blows? I wrote the most words. 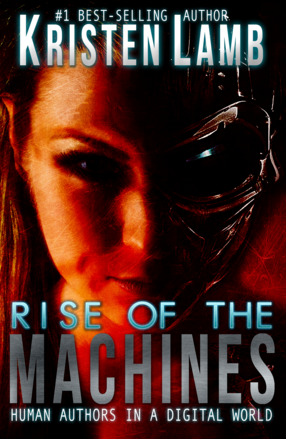 I blogged 5 days a week and wrote a novel and Rise of the Machines during one of the hardest of those years. Not because I am special. I am in no way being prideful or not meaning to at least. I am simply saying that our mind is POWERFUL and if we wait on emotions or circumstances to be ideal? We will never write. And trust me, I have FAILED as much or maybe even more than I succeeded….which is why I emphasize PROCESS. I love pointing out the time I finished Nano in 12 days despite pneumonia…but there were other times I hid in a blanket fort in my room praying to Saint Cabernet wishing I had the power to strike people with lightning. I fell apart, derailed, and had to confess the horrible, painful, humiliating truth…. I am human. Flawed, broken, often stupid and sometimes petty. BUT, every day is new and the cool thing is I still can CHOOSE. This success thing is a law of averages, not based on one bad day or week or season. We all fall, but we get up. And the point of the really long reply is none us have this $#! * figured out. But there are some pretty good basics. Some days we will nail them. Others? We ARE the nail and life the hammer. And if you don’t want to do NaNo, WANATribe is there and has been for two years. We meet every morning in the chat room at 7:30 CST “officially” and often go all day. We sprint 40 minutes at a time. Sprints can even be used for taking the 40 to do a workout tape :D. So long as we are doing meaningful, focused work. We check in, I set the timer and GO. Maybe you write, or edit, or you have been sitting too long so dedicate a sprint to cleaning ur bathrooms then u will get back to writing. The thing is WE are NOT alone. We are a team of flawed people. I know I can be lazy , sidetracked, controlling (of everyone else instead of me) and accountability makes me better. And now when life sucker punches me, I have friends and people to lean on. In the end, I am SO proud of you for what it is worth. No one does it perfect and those who do we all secretly hate them so it’s okay. It doesn’t matter when or how you do it, just do it. And come hang out with us if you like :D. We are super fun! Wow Kristen. I’m sitting here with my mouth hanging open. Holy crap. Thank you for being real. Thank you for being honest. Thank you for sharing. The fact that you are still standing, still writing and still pushing some of us to get past our laziness and excuses (speaking of myself only) is a testament to the power of your will. You make time for what’s important. You discover solace and healing in your passion. That is impressive. I will share that after I read your initial blog, I had great plans to write. On my hour commute home, I planned what I was going to write and how. And then, my night took an unexpected turn. I helped my son through three hours of homework last night. It was not the night I had planned, but he was overwhelmed. I had to help him. After his homework was done, I sat down and wrote for 8 solid minutes. Not much, but my goal was not to log a lot of time, but sit in the chair, write and prove to myself that despite unexpected life circumstances, I could make time. I can make time, and it’s going to take a daily commitment to just show up. Thank you for the inspiration. I might have just sat in the chair and longed to write if I had not read your blog. Thank you. Thank you. Thank you. Go WANA Mama! You rock! I am trying to beat procrastination with busy brain. I have lots of cheerleaders, but no hard@$$…. I’m currently taking a fiction writing course, bit I noticed that it doesn’t require writing every day. I may need to do Nanowrimo again. Kristen , your blog is the perfect mix of motivation with a touch of nonsensical fun to get me unstuck! Thank you for this timely piece. Well, this one hit me where I live. I have no issues being consistent with every other thing in my life EXCEPT writing. It gets pushed to the side or “I don’t feel like it”. Thanks for the kick in the pants. Nano here I come. I think I’m going to pin this article to re-read over and over as needed. Hey Kristen, great post. I love writing the first drafts and do so fairly quickly. I get hung up on the editing phase and it reminds me of playing the game Perfection when I was a kid. The clock is ticking, the whole thing feels like its about to explode, some pieces don’t fit and all we want is a polished, finished manuscript to submit to the agents. When do you know its your most polished work? When do you know your editing is enough and just hit send? I always seem to find something else to fix (or perfect). Thank you, Kat Kent.